The Atomos Ninja Inferno Recorder is equally adept in the editing suite as it is in the field with the recorded files dropping directly onto the timeline of all the major NLE editing and grading software with the HDMI input capable of accepting HDR signals to make the Ninja Inferno an unbelievably affordable HDR reference monitor for portable or in studio color grading. The Atomos Ninja Inferno Recorder unlocks the professional capability of 4Kp60 10-bit cameras, bypassing the internal recording limitations and taking full advantage of the sensor by recording to the camera's maximum color accuracy, color resolution and dynamic range. Monitor and Record HDR or Rec709 up to 4:2:2 10-bit as Log high bitrate Apple ProRes or Avid DNxHR. Apart from being an obvious companion for 4Kp60 cameras like the GH5, the Atomos Ninja Inferno Recorder is the world&apos;s first HDMI monitor-recorder to accept 4K DCI signals from cameras like the Panasonic. The rugged case with built-in armor houses an arsenal of professional connectivity including full size HDMI 2.0 for signals up to 4K 60p, a HDMI output for playback or play-out to a view finder or other monitors, a hot swappable dual battery system for continuous power backed up with DC mains connectivity, auto HDMI start/stop recording trigger from selected Canon, Sony, Panasonic and Nikon cameras and even conversion of interlace video from your camera to progressive with built-in 3:2 and 2:2 pull-down. As a creative professional you must always be ahead of the curve - today that means HDR at 4Kp60. 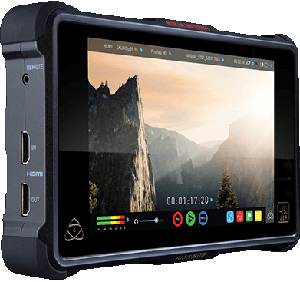 Atomos Ninja Inferno delivers the simplest, most cost effective and technically superior HDR workflow. Go HDR today by setting your camera to Log, enabling the powerful AtomHDR engine to expose vibrant natural HDR video & then grade and edit with confidence on any Mac or PC using the Ninja Inferno as your portable grading monitor. The 7" 1920 x 1200 monitor not only has the resolution and pixel density to make every shot look amazing, the high bright 1500nit screen at almost 4 times the brightness of conventional field monitors lets you shoot outdoors without reflections washing out your image. This makes it a great choice for gimbals, Steadicam and director&apos;s monitors, delivering a crisp 4K image without the bulk and viewing angle restrictions of a sun hood.